My wife is working on a photography session that depicts a circus that has been corrupted by various monsters. One of the characters is a juggler. She asked if I could come up with a skull that the juggler could juggle. 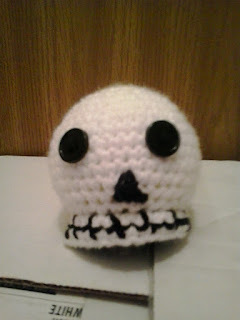 This is the pattern for the skull tennis ball cover that I came up with. THIS WOULD BE A GOOD TIME TO SEW ON THE BUTTONS AND EMBROIDER NOSE. INSERT TENNIS BALL, WHILE HOLDING IN PLACE, CONTINUE TO CROCHET AROUND IT. YOU MAY NEED TO PULL YOUR FINISHED WORK TIGHTLY TO GET IT TO COVER TO COMPLETELY. Rd 14: (sc in next 3 sc, sc2tog) around. (24) Change to black. Finishing off leaving a long tail. Weave tail through sc of Rd 17, pull tightly, and secure. Weave in ends. Finish off. Weave in ends. Using black, embroider lines on TEETH.